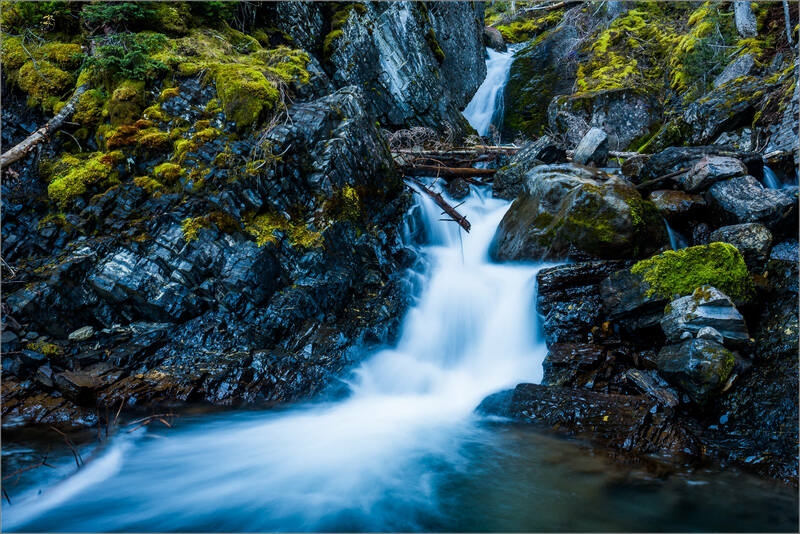 The Sarrail Falls that spill across several terraces before emptying into the Upper Kananaskis Lake is a beautiful stretch of water surrounded by heavy forest in the steep hillside of Mount Sarrail’s lower slopes. The path to this waterfall starts at the lake’s eastern parking lot and is set just above the shoreline. It is a comfortable trail that is about 1-1.15 km to this feature but carries on around the entire lake. I had planned to complete the loop but spent almost two hours watching, photographing, enjoying and studying the waterfall instead. The 2013 flood hit this creek heavily destroying the bridge as well as sending tree trunks and boulders cascading down. These are still found perched, lodged or lying nearby all along the water’s path. I found a beauty in these that added to the overall scene and suggested to me the cycles of birth, growth and death as well as of constant change. Along with the varying crescendos of the water’s orchestra, I found myself enjoying some deep thoughts and the time to chew on them – a luxurious gift to allow oneself! At the end, with the morning moving quickly towards noon, I chose the short walk back and the lunch I had waiting for me. 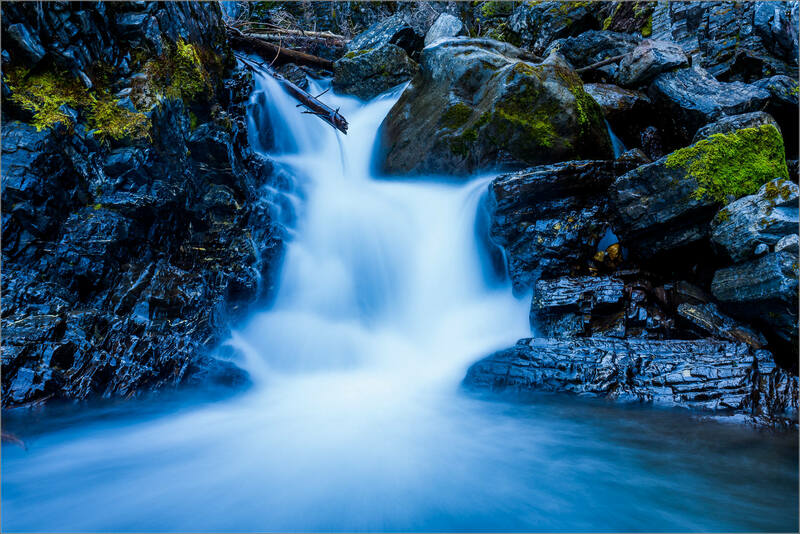 This entry was posted on October 5, 2015 by Christopher Martin. 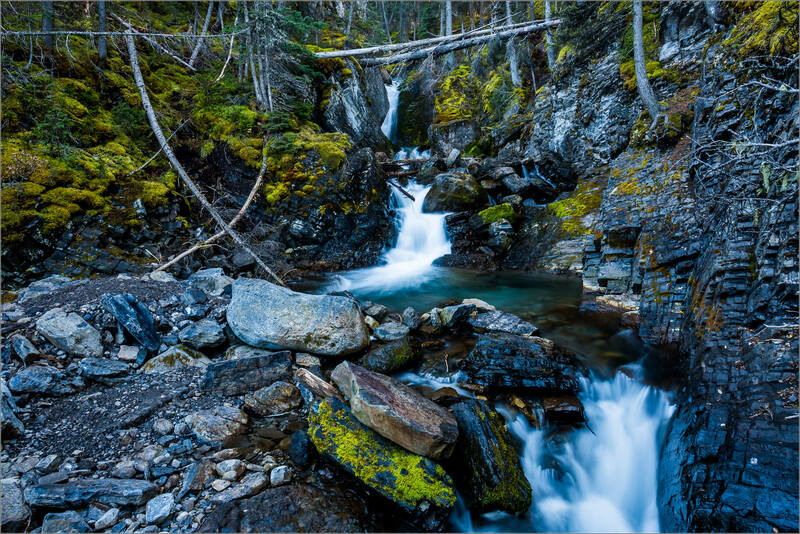 It was filed under Alberta, Kananaskis, Landscapes, Nature and was tagged with alberta, Canada, Kananaskis Country, landscape photography, nature, Sarrail Falls, waterfall.